1.In large bowl, whisk together orange juice, oil, mustard, honey, zest, coriander, salt, pepper, paprika and turmeric. Divide chicken into 2 large zip-top plastic bags; place zucchini, fennel and orange slices into separate large zip-top plastic bag. Evenly pour orange juice mixture into each bag; seal bags pressing out excess air. Massage ingredients in bags to coat with marinade; refrigerate 3 hours. 2.Preheat oven to 425°F. Evenly spread chicken mixture, skin side up, onto large rimmed baking pan; evenly spread zucchini mixture onto second large rimmed baking pan. Roast chicken and vegetables 45 minutes or until internal temperature of chicken reaches 165°F and vegetables are tender. 3.Transfer chicken and vegetables to large serving plate; cover to keep warm. Pour off fat from drippings in chicken pan; place chicken pan across 2 burners. Add vegetable pan drippings and wine to chicken pan; heat to simmering over medium heat, stirring frequently to remove browned bits from bottom of pan. Reduce heat to medium-low; simmer 5 minutes or until slightly reduced. 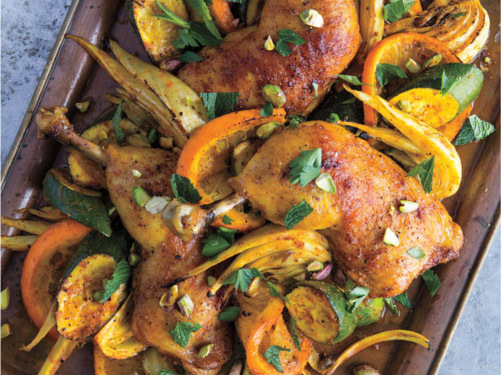 4.Serve chicken and vegetables sprinkled with parsley, mint and pistachios, if desired, along with pan juices.